It was the kind of Spring day that makes you happy to be alive, when the weather is perfect and warm, the birds are singing, and the cherry blossoms are in full bloom. This was just such a day for Laura and Maciek’s wedding. The day started with both the bride and then the groom, getting ready at the bride’s house. Our filming captured the whole place bubbling with laughter and excitement as hair and makeup was being applied, speeches were being written, food and refreshments were being enjoyed, and dresses and suits were put on. Our wedding couple’s first look was beautiful as Laura’s bedroom door swung open to reveal each of them to the other. Their wedding ceremony took place mid afternoon at the soaring, breathtaking Trinity College Chapel. The processional was riveting as the bridesmaids and flower girls walked the length of the chapel in gorgeous dresses holding stunning bouquets, followed by Laura & Maciek who appeared together, arm-in-arm, both looking incredibly elegant. 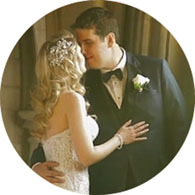 A beautiful service was conducted by Laura’s uncle who is an ordained minister, and when the two were finally officially married, the wedding party headed for several nearby locations on the University of Toronto grounds for wedding pictures and creative wedding videography. Their wedding reception took place at the Royal Ontario Museum in the presence of the dinosaurs, a Buddha statue, suits of armour, and many other ancient museum relics. The day was so memorable… as wedding videographers we were so happy to have been able to film such beautiful places and events during the entire wedding day. The result is what we consider to be a couple of gorgeous wedding films and Laura & Maciek agreed. We hope you enjoy their wedding highlights film.